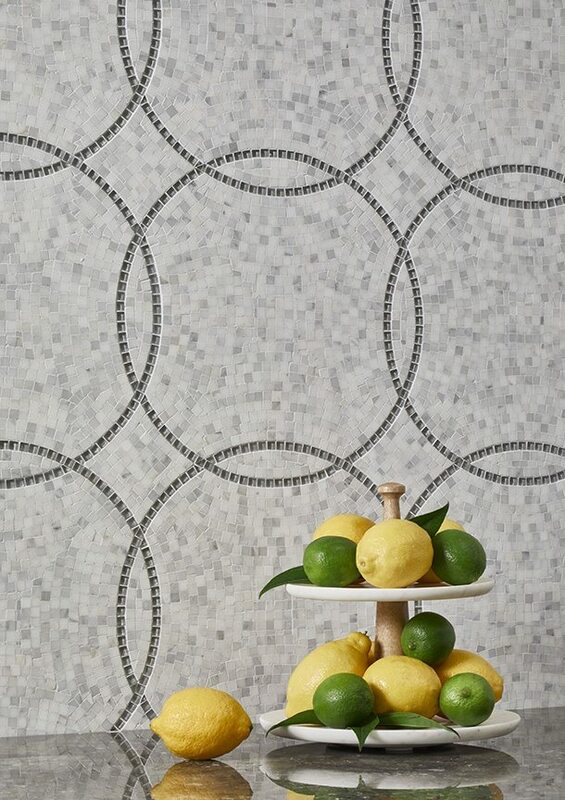 Originally introduced in 2009, the Eternity Collection has grown to become one of AKDO’s most classic mosaic designs. 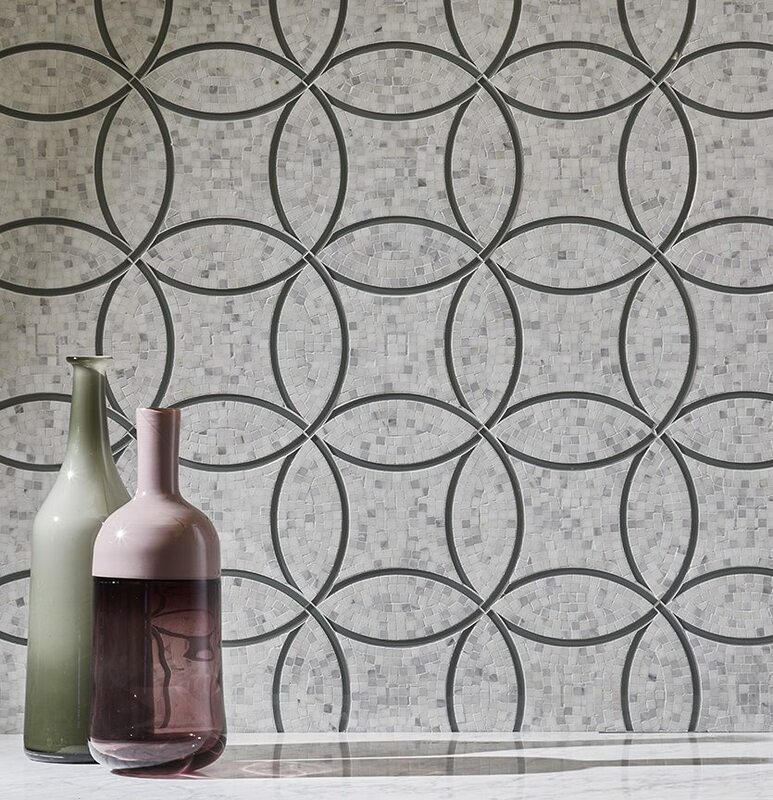 Its interlocking mosaic circles create endless patterns, and a timeless, serene feel when used in spaces. The design was originally inspired by the mathematical symbol of infinity, and evokes a knot, which in many cultures represents the continuity of love and life. 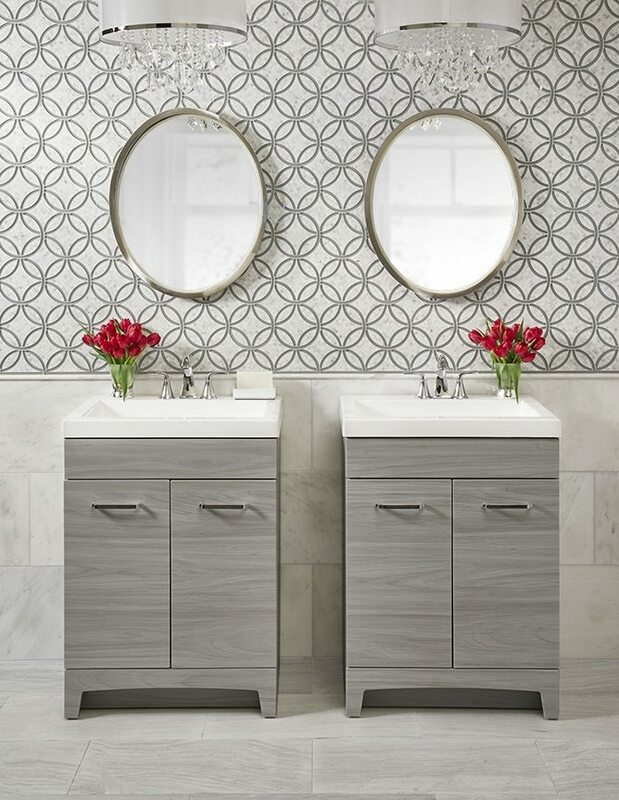 This year, AKDO has relaunched the collection and incorporated water jet and glass accents, and added new modern gray and white colorways. 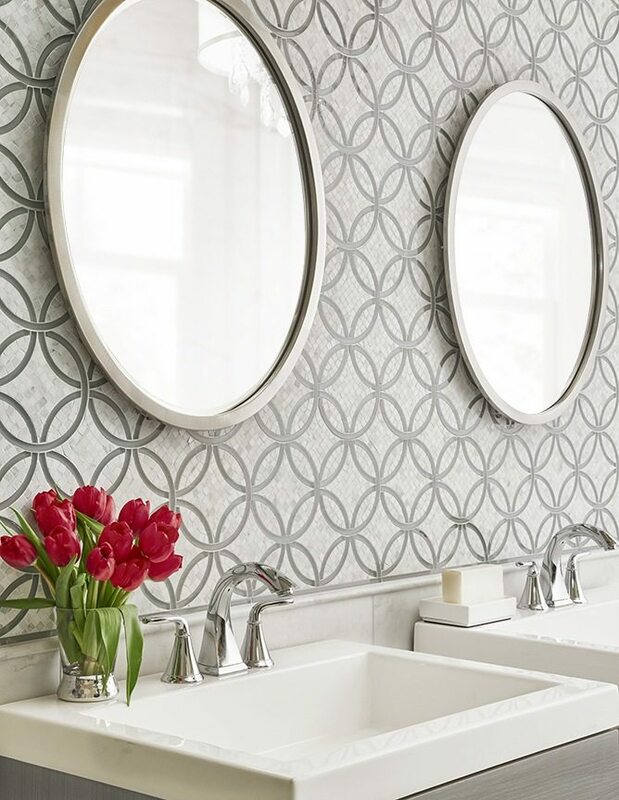 An all-new pattern has also been introduced to the Eternity Collection, and the existing patterns have been reworked to interlock seamlessly, resulting in the look of a hand-installed mosaic field. The new pattern in question is Eternity Quattro, which was inspired by the ancient Quatrefoil symbol, which in Latin, literally translates to “four leaves.” Since ancient times, Quatrefoils have represented good luck and balance because of their equal proportions; similar to the way a four-leaf clover still signifies “luck” today. It experienced particular popularity during the Gothic and Renaissance eras, where it was often featured in the arches of cathedrals or stained glass windows. Below, see the remaining Eternity patterns that have been revamped to connect more flawlessly, with new colorways that feel fresher than ever. We hope you enjoy this rejuvenation of an eternal classic. Eternity Empire is the largest-scale pattern from the Eternity Collection. 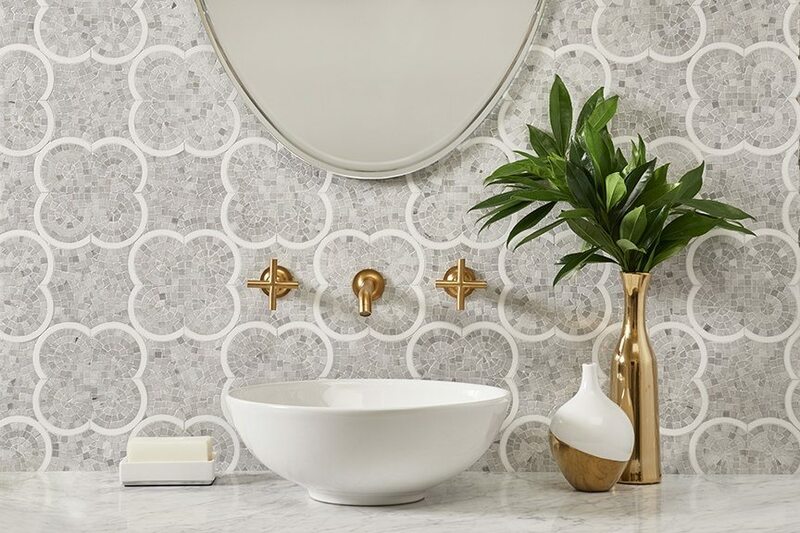 Inspired by ancient mosaics found in the grounds of a Turkish Palace, it maintains a timeless feel reminiscent of empires long passed. 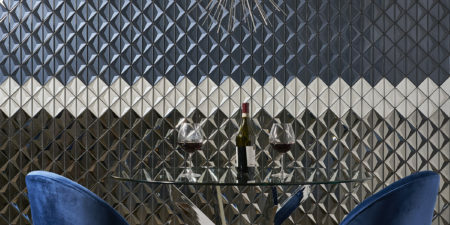 To bring a fresh edge to this classic pattern, waterjet glass details have been added that capture light and add an extra element of depth and sparkle. Imperial is one of the smaller Eternity patterns, with circles measuring about six inches tall. The water jet rings overlap each other, creating an elegant chain mail effect, which is enhanced even further by the hand crafted mosaic background. Use this pattern to fill a wall for a wallpaper effect, or even use it to create focal points. Eternity Timeless is a larger scale version of the Imperial pattern. The water jet circles yield a more modern, larger field of pattern, making it perfect for creating bold, graphic fields. 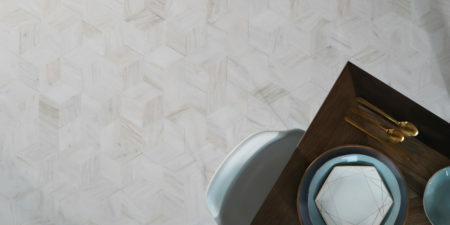 It also looks striking when combined with Imperial, as it offers a play on the different scales of the circular pattern.